Early descriptions of the split step reported both feet landing on the court simultaneously after the athlete made a small jump and then reacted left, right, forward, or backward, depending on where the ball was hit. Now it is known that good athletes react in the air during the split and land on the foot farthest from their intended target a split second ahead of their other foot. Flexibility training is often the most overlooked component of a quality conditioning program. Some of the reasons people do not adhere to flexibility programs include the following: Stretching may not feel particularly good. The on-court benefits are not obvious to the player. Applying the energy system continuum to tennis is easy and helps illustrate the reason that both anaerobic and aerobic conditioning are necessary for enhancing tennis performance. Because tennis ultimately involves repetitive muscular contractions and exertion, the aerobic energy system provides the baseline energy production over the duration of a tennis match or practice session. The most common injury site in the shoulder is not the rotator cuff muscles themselves but rather the tendons that attach these muscles to the upper arm. There is not a lot of space inside the shoulder. When muscles fatigue or improper technique is used, it is very easy for one of the rotator cuff tendons that pass through this space to get pinched. Increase shot power and on-court speed and agility with the most comprehensive tennis conditioning resource available. Combining 204 drills and exercises with online access to 56 video demonstrations, the only strength and conditioning resource endorsed by the USTA will help you outlast the competition. Improve shot power, increase on-court speed and agility, and outlast the opposition with Complete Conditioning for Tennis, the most comprehensive tennis conditioning resource available! Throughout, you will have access to the same recommendations and routines used by today’s top professional players. From increasing the speed and power of your serve and groundstrokes to enhancing on-court agility and stamina, you will be ready to take the court with confidence and endure even the most grueling matches. Off the court, you’ll learn recovery techniques and preventive exercises for keeping shoulder and elbow injuries at bay. Featuring more than 200 on- and off-court drills and exercises combined with exclusive online access to 56 video clips, Complete Conditioning for Tennis is an essential resource for players, coaches, instructors, and anyone serious about the sport. The United States Tennis Association (USTA) is the national governing body for the sport of tennis and the recognized leader in promoting and developing the sport’s growth on every level in the United States, from local communities to the crown jewel of the professional game, the U.S. Open. Established in 1881, the USTA is a progressive and diverse not-for-profit organization whose volunteers, professional staff, and financial resources support the singular mission. The USTA is the largest tennis organization in the world, with 17 geographical sections, more than 700,000 individual members and more than 7,800 organizational members, thousands of volunteers, and a professional staff dedicated to growing the game. In addition to the professional side of the sport, the USTA offers sanctioned league-play opportunities to players 18 years of age and older. Camps and other instructional opportunities are also provided to younger players around the country. Mark Kovacs, PhD, FACSM, CTPS, MTPS, CSCS,*D, USPTA, PTR, is a performance physiologist, researcher, professor, author, speaker, and coach with an extensive background in training and researching elite athletes. He runs a consulting firm focused on optimizing human performance by the practical application of cutting-edge science. He is a consultant to the ATP, WTA, USTA, and NCAA. Dr. Kovacs also is the director of the Life Sport Science Institute and associate professor of sport health science at Life University. Heovacs has worked with hundreds of elite athletes and more than two dozen top professional tennis players, including John Isner, Robby Ginepri, Ryan Harrison, and Sloane Stephens. He formerly directed the sport science, strength and conditioning, and coaching education departments for the United States Tennis Association and was the director of the Gatorade Sport Science Institute as well as an executive at Pepsico. He is coauthor of the book Tennis Anatomy (Human Kinetics, 2011). Dr. Kovacs currently is the executive director of the International Tennis Performance Association (iTPA), the worldwide association for tennis-specific performance and injury prevention. He is a certified tennis performance specialist and a master tennis performance specialist through the iTPA. He is also a certified strength and conditioning specialist through the National Strength and Conditioning Association (NSCA) and both a USPTA and PTR certified tennis coach. Dr. Kovacs is a fellow of the American College of Sports Medicine. In 2012, he was the youngest-ever recipient of the International Tennis Hall of Fame Educational Merit Award. Kovacs was a collegiate All-American and NCAA doubles champion in tennis at Auburn University. After playing professionally, he performed tennis-specific research and earned a master’s degree in exercise science from Auburn University and a PhD in exercise physiology from the University of Alabama. E. Paul Roetert, PhD, FACSM, is the chief executive officer of SHAPE America, the largest organization of professionals involved in school-based health, physical education, and physical activity. Founded in 1885, SHAPE America is committed to ensuring all children have the opportunity to lead healthy, physically active lives. He holds a PhD in biomechanics from the University of Connecticut and completed his bachelor䃅s and master’s of science degrees in physical education at California State University at Fullerton. 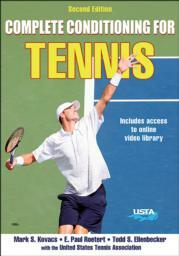 Dr. Roetert has authored four books, including Tennis Anatomy (Human Kinetics, 2011). He has written numerous chapters and articles related to the fields of health, fitness, sport science and medicine, and strength and conditioning and has given hundreds of scientific and invited presentations worldwide. He is a fellow of the American College of Sports Medicine and an honorary professional of the Professional Tennis Registry and became a master professional with the United States Professional Tennis Association in 2005. In 2002 he received the Educational Merit Award from the International Tennis Hall of Fame for outstanding service to the game. Roetert received the Editorial Excellence Award in 1999 from the National Strength and Conditioning Association for his work on the Journal of Strength and Conditioning and Research, and in 2000 he received the Outstanding Alumni Award from the University of Connecticut. Todd S. Ellenbecker, MS, DPT, SCS, OCS, CSCS, is a physical therapist and clinic director of Physiotherapy Associates Scottsdale Sports Clinic in Arizona and is the vice president of medical services for the ATP World Tour. He received his bachelor’s degree in physical therapy from the University of Wisconsin at LaCrosse in 1985 and a master's degree in exercise physiology from Arizona State University in 1989. He completed his doctor of physical therapy from MGH Institute of Health Professions in 2006. In addition, he is certified as a sport clinical specialist and orthopaedic clinical specialist by the American Physical Therapy Association. He is a certified strength and conditioning specialist by the National Strength and Conditioning Association and was named their Sports Medicine Professional of the Year in 2003. Dr. Ellenbecker is the chair of the International Tennis Performance Association Certification Commission and a certified USPTA tennis teaching professional and was the chairman of the USTA National Sport Science Committee for more than a decade and still serves as a committee member. Todd is also the national director of clinical research for Physiotherapy Associates. In 2007 he received the Ron Peyton Award by the Sports Physical Therapy Section and in 2008 was the recipient of the Samuel Hardy Educational Merit Award from the International Tennis Hall of Fame. Ellenbecker serves on the editorial boards of the International Journal of Sports Physical Therapy and Sports Health. He has conducted and published research primarily on upper-extremity athletes as well as shoulder and elbow rehabilitation. He is the author of several books, including Strength Band Training (Human Kinetics, 2011) and Effective Functional Progressions in Sport Rehabilitation (Human Kinetics, 2009). Ellenbecker lives in Scottsdale, Arizona, with his wife, Gail.